Are you ready to join in the fun and make our next afghan?? Last month you all voted and chose our next design… The winner was a surprise design by me!! Yikes,,, I hope you love what I have come up with!!! 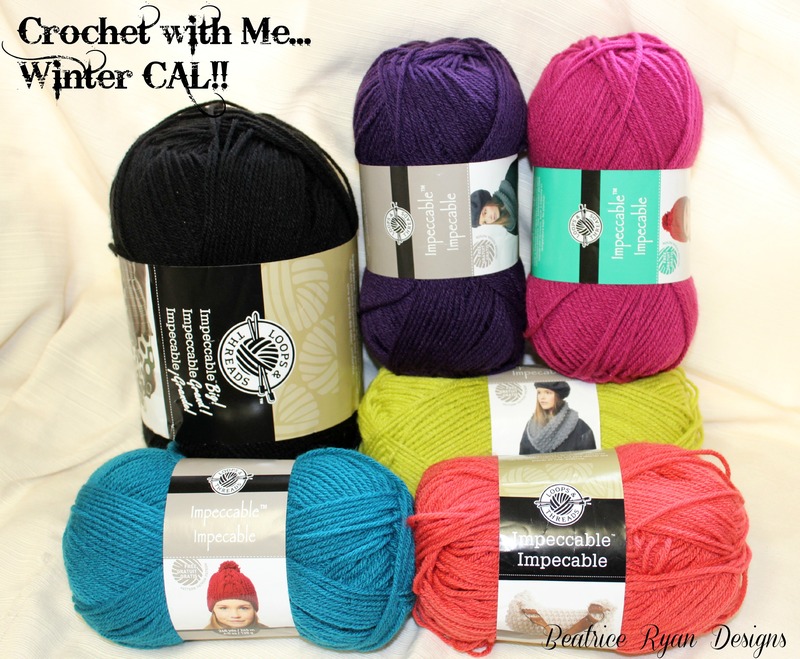 I have chosen my yarn and sketched out the design… I’ve started crocheting and I am ready for you to join in the fun!! How do you join this Crochet with Me Winter CAL?? It’s easy,,, Just check in each week and I will be posting the instructions right here! I will post just the right amount of crocheting that will hopefully make it enjoyable and easy to finish each week… You can also click on the Crochet with Me tab at the top of the page if you want to see all the posts or need to catch up!! What else will we do during the Crochet with Me Winter CAL?? Also,,, A Pinterest Page! 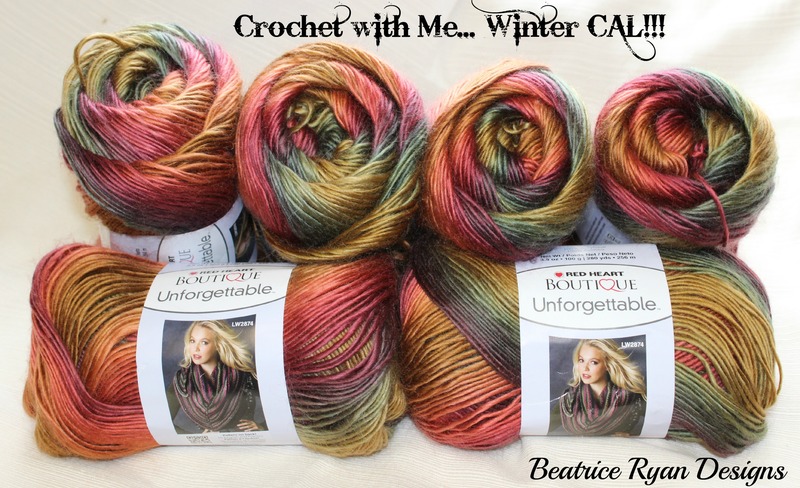 You can post your progress pictures right to Beatrice Ryan Designs Crochet With Me CAL Page… Just email me your request to [email protected] and I will send you an invite to join the page!! So are you ready to get started?? I will be making 2 afghans with 2 styles of yarn… One afghan in self striping yarn and the second afghan in traditional yarns, changing the colors as needed!! You can choose either of these styles to make this one of a kind retro afghan!! For afghans using the “Self Striping Yarn” ~ 2500-2800 yards Red Heart Boutique Unforgettable Yarn (or any self striping yarn of your choice) *Not variegated yarn. AND 600-800 Yards of a complimentary color for joining and the border. This yarn will work up slightly smaller than traditional worsted weight and your end project will be slightly smaller overall. For afghans using “Traditional Yarns” ~ A Minimum of 3 base colors or up to 8 base colors and 1 color for joining and edging. Approx. 3000 total yards… Using 600-800 yards of each color. Hook~I or if using Red Heart Unforgettable Yarn you can size up to a J hook due to the smaller gauge of this yarn. We will be starting next Sunday, January 18th with our 1st weeks crochet assignment! So get your yarn and hooks ready!!. Yes… Week 7 is listed with all the other links on the Crochet with Me tab at the top of the page… Thank you ! !